Fall is my favorite season for baking because everything is so warm, rich, and delicious. 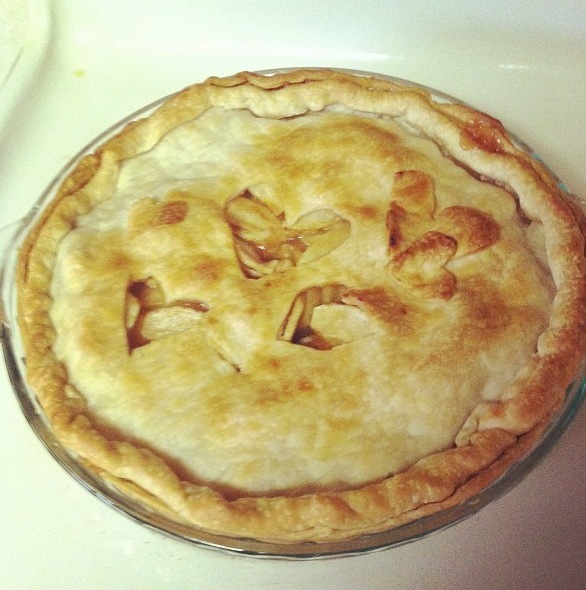 One of my absolute favorites is apple pie, but the hardest part about any pis is the crust. I live in a small apartment and don’t always have all the space, or equipment, or ingredients (or really the time) to make crust, so let me tell you a secret: I love to cheat. It turns out that Pillsbury unroll-fill refrigerated pie crust is delicious. I used their crust and recipe to make this pie that is absolutely perfect for a fall treat. 1. Heat oven to 425°F. Place 1 pie crust in ungreased 9-inch pie plate. Press firmly against side and bottom. 2. In a large bowl, gently mix filing ingredients; spoon into crust-lined pie plate. Top with second crust. Wrap excess top crust under bottom crust edge, pressing edges together to seal; flute. Cut slits or shapes (I did hearts) in top crust. 3. Bake 40 to 45 minutes or until apples are tender and crust is golden brown. Cover edge of crust with 2- to 3-inch wide strips of foil after first 15 to 20 minutes of baking to prevent excessive browning. Cool on cooling rack at least 2 hours before serving (or ignore this and dive right in). This recipe is really easy (and that’s coming from an unskilled baker) and will have everyone thinking that you are a master in the kitchen.